Have you ever wondered how this amazing company Stampin' UP! got it'a start 25 years ago. I am sharing this from the Co-founder and CEO Shelli Gardner's Blog, click HERE to go to it. I love it that she is a mom just like you and me with a family that started Stampin' UP! in her living room. Here is her story. 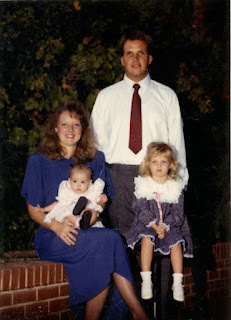 Twenty-five years ago, my sister Vonna and I were neighbors, living in Las Vegas. Our sweethearts were working in construction, and we were both stay-at-home moms, with young children at home. I was feeling a need for social interaction; Vonna was looking for a way to supplement her family income. 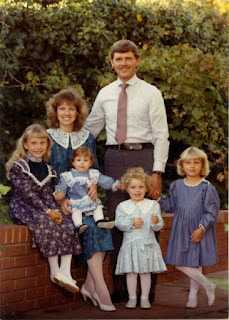 Shelli and her family below. We’d both dabbled in various direct-sales businesses, and when we discovered stamping we knew we’d found the product we wanted to sell! However, we couldn’t find the right combination of service, opportunity, and quality products. So we created it ourselves! We learned so much those first few months—growing from operating out of our living room to a warehouse in three months, and then moving to an even larger warehouse a few months later. Ultimately we bought our own property (my dad’s old truck shop) in Kanab and continued to grow. That growth caused a bunch of challenges (we call them opportunities today, but they sure felt like challenges back then!) and a huge learning curve for us. We took a real-life crash course in Business 101 and figured out a lot of things that continue to benefit us today, both personally and professionally. And looking back, I wouldn’t have changed a thing. . . well, at least not very many things! Vonna and her family below. So there’s a little glimpse backwards. I’ll share more memories throughout the year. I’d love to hear what you’d like to hear me reminisce about. . . Check back to Shelli's blog for inspiration and stamping ideas etc. I do all the time and have even cased a few from time to time. I love it that she still stamps when she has time. Thought you might be interested. Thanks for stopping by, have a blessed week. My stamp club meets the 3rd Sat of the month and I am always trying to come up with something they will like and something they can use. This week we made 2 cards and this cute clear mount stamp case gussied up a bit. I pulled out my various 12x12 dsp, some retired some not and let them pick the colors they wanted. I had my scraps of cardstock for them to use on the back of the decorative label punch. For the inside I printed a 2013 calendar with MDS and we added dsp to the pen which was the hardest part of the whole project. Some twisted dsp around in a circle because the pen part did not come out; some cut strips of dsp and folded in a circle and slipped it in. Good luck on that! You will notice the jr. legal pad has no top to it where it pulls off! A little story here, sometimes when we explain something,the person listening is not hearing your inside thoughts and we think they get it. :) I told the guy I wanted him to cut it at 7 inches and he was so worried about the top part bulking in the machine when he cut them and wanting me to pay for two cuts so it would not bulk. Ok so I did not actually say cut the bottom not the top!!! When he came back I was sick, he cut off all the top part that holds the pad together. I said oh no that is not right, that is not what I asked for (really I don't think I made myself clear) he could see I was very distraught and said not a problem let me heat up my glue padding machine and I will fix that for you. Well I don't have a cute piece of dsp on the top like I wanted but at least I have pads that work. Well that did not bother my club as much as it bothered me. You should have heard them they were so excited they were chattering away about how they were going to use them; hostess gifts, (this group lovessssssssssssssss to have dinner parties and I bet they will use them in the near future) Sunday School gifts, office gifts they just kept going on and on. I love it when I teach them something that excites them so much. For the rest of my club projects I totally cased...... (Copy and Share Everything) The first one was from Sue Root, one of my team members, she brought this card for one of her sample cards for our team meeting this month. This next card I received from our Stampers Xpress Stampin UP Group swap Kelly recently hosted. I loved it and I am so sorry I can't find the paper that was with it to give credit for it. It is adorable and the girls loved making it. When we used the peek a boo frames (big shot die) they said we don't remember seeing this. (I forget to use it myself.) I reminded them of the framed art I did one Christmas with it. This card was created by TERRY BRINKMAN (Sorry I did not have that information when I posted. Thanks for stopping by, have a blessed week. This is a very simple wreath and so easy. I cut out the hearts from Hearts a Flutter Framelits and hot glued to wreath and added the Welcome banner. You may recognize the wreath from the fall leaves wreath I made last fall. I simply used my hair dryer and melted the hot glue and the leaves came right off and now I have hearts and you will see other things in the future. On Saturday I had a team meeting and I love getting and sharing new ideas. Elaine had a really cute card and I changed it with my favorite colors and dsp and made it my own. Thanks Elaine for your inspiration. I love it when my team gets together and stamp and talk business and share with each other. If you would like to join my team check it out. This is a wonderful time to join during SAB since you get an extra 25% FREE merchandise with your starter kit for only $99.00 you get $156.50 worth of wonderful Stampin’ UP! products. For more details check it out HERE. Thanks for stopping by, have a blessed week! Martha Middleton is in my Marvelous Stampers Stamp Club as a matter of fact I think she came up with their name for the club. 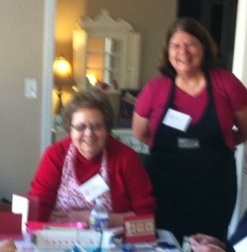 Martha is so sweet and so enthusiastic and loves to stamp and share with us. She received her All Dressed Up Bundle last week and went to work she emailed me some of her pictures and I love her work. I would wear that dress. Thank you Martha for sharing this with us. I love to showcase your work. During our club meetings, they all share and help each other out; if we are punching hearts one of them will punch hearts for everyone etc. Martha is our Big Shot Queen and loves to show off her Big Shot Skills which she is very good at. Here she is cutting hearts for the candy topper. Gloria is filling her cello bag with M&M's. Below Dianne and Lavon are looking at Martha work as they create! The other side of the table is our guest Levette, (Barbara's sister), Barbara and Shirley! This stamp club is so much fun and they keep me on my toes. Thank you Martha for sharing your new dress. Below is a tag I made for each of the club members with everyone's birthdate on the back so when it is their birthday month we bring birthday cards to the birthday girl! Here are the elements in process as I was putting them together. We had to wait a week to have our Valentine Stamp Camp because of the freezing rain we had last week but we had a great day yesterday and everyone was happy to be stamping together. I am posting some of our projects some were cased (copy and share everything) and some were original and all were great. 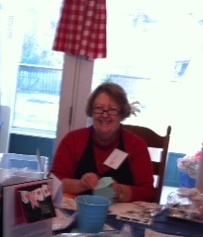 Below is Elaine Sykes and this was her first stamp camp and she had a great time demoing her project. I wish I had checked my viewer before I let them go. It is a lousy picture but I did not want to leave them out. Karel Standish seated and Pat Stockton standing. Our guest loved working with them also. Table 1- Barbara, Shirley, Karel, Pat, Nancy and Anne's shirt. :( Sorry Anne! Table 2 - Gloria, Retha, Elaine and Deanna. I am missing 2 projects but this gives you an idea of what we made. Be sure to check back for my next stamp camp. 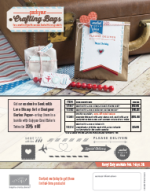 During this limited-time offer, you can purchase the exclusive Sent with Love Stamp Set or Sent with Love Designer Series Paper-or bundle them for a special 20 percent discount! For more information click on the flyer below and view it larger.